Commerce is currently in public beta. This means that we consider it stable enough to use in production, but still lacking some features. We've got ambitious plans to make Commerce the best e-commerce solution available for MODX, which takes time. In this roadmap, we're publishing part of our plans and progress towards v1.0. Once we hit that, we'll update the roadmap with our plans beyond v1 which includes features like subscriptions, Ebay/Amazon integration, an improved status workflow editor, and lots more. Send us a note via [email protected] or post on our community forum if you have any questions or feature requests. 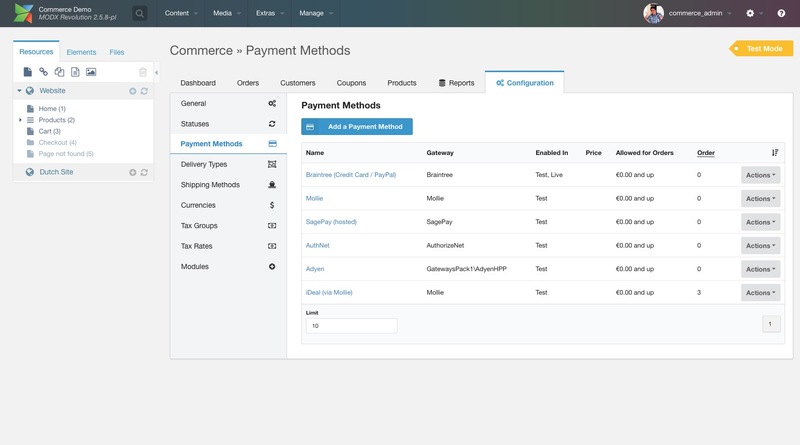 Currently we're focusing on getting Commerce to version 1.0. The criteria we use for that milestone is that it needs to cover the majority of use cases from core packages and available extensions. That's a big shoe to fill, but we're confident we're almost there. After the release of 0.12, no more 0.x releases are planned. "Price Strategies", which will allow you to define temporary sale pricing, as well as bulk pricing, on individual products. Various iterative improvements to parts of the dashboard design, in particular the home screen. There's more we want to do, of course, but with these features we've reached the baseline we're looking for in the 1.0 release. As we have a worldwide user-base, we're looking at providing gateways and integrations that allow people and businesses all over the world from accepting payments online. As there are also hundreds (if not thousands) of different payment solutions, we have to prioritise them. We base the prioritisation for the largest part on number of requests we get. In October 2016 we did a survey and that's a large part of the prioritisation you see listed, below. If you would like to use a certain gateway that is not yet supported, please let us know and we'll count your vote. Other factors we look at for determining what to work on next include the required effort (some gateways are more complex to integrate than others) and how a gateway fits in with the rest of our offering. For example, if we already offer 5 options to accept credit cards globally, for example, yet another credit card gateway gets a lower priority compared to a gateway that offers a regional solution we don't support yet. It's also possible to build payment gateways as extensions, so if you are (or have access to) a developer, you could consider building the integration you need that hasn't quite made it to the top of our list. If you're missing a gateway, or would like to express your support for one of the above gateways, let us know via email or post on our community forum. Integrating with third party services is also a very interesting aspect of e-commerce. It's not currently (pre-1.0) our main focus, as Commerce can already be extended in various ways, allowing other developers to build the integrations they require. If you build an integration, we would strongly encourage you to make those available for other users as well. There's a list of available extensions, both official and third party, here. There's much more that could be done in this area. From CRM to accounting systems. Such integrations will largely be driven by demand, so be sure to let us know if you have any requests.